Over 4,000 Cryogenic Pre-Insulated Pipe Supports Designed for LNG Service | Piping Technology & Products, Inc.
PT&P designed over 4,000 supports for LNG service in Texas. 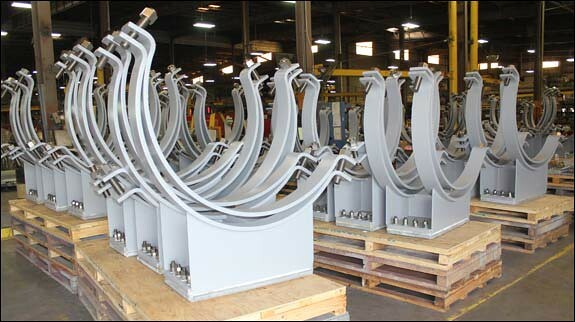 These pre-insulated pipe shoe and clamp assemblies were custom designed for cryogenic temperatures with special low temperature grade NP500CR Micarta® insulation. This type of Micarta® consists of a glass fabric with a special formulated epoxy resin. 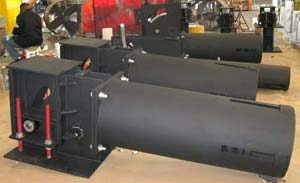 It has excellent physical properties at operating temperatures down to -459°F. It has very low thermal conductivity and has been produced specifically for use in cryogenic applications. The shoes pictured are fabricated from 304 L stainless steel with a protective coating and are designed for a 56″ diameter pipeline. The shoes measure 20″ long, 36″ wide and 75″ high. 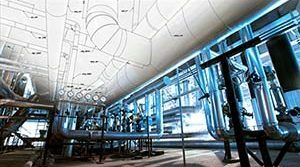 This project included supports varied in pipe sizes from ¾” to 56″ diameter. A load test was performed prior to shipping this rush order.